Naada Habba, the land gets festive, the triumph of the Durga over Mahishasura Mardini, this was what navaratri meant to me, it meant the best of music Kutcheri, the vibrant classical dance festival, visiting friends to see the doll display. most important the ten days of holidays. Navratri is back and it is rather sad that the Dandiya has been so advertised and commercialized the navaratri has got equated and trapped in Dandiya. The worship of the divine feminine and the cycles of nature have completely got side tracked. I used to have a doll display in my bedroom. My mother did not discourage me, she actually gave me some constructive inputs, yet she was hesitant to have it annually. When I got married into a Mysore family, and my daughter was born, I decided to have the Bommbe Habba. 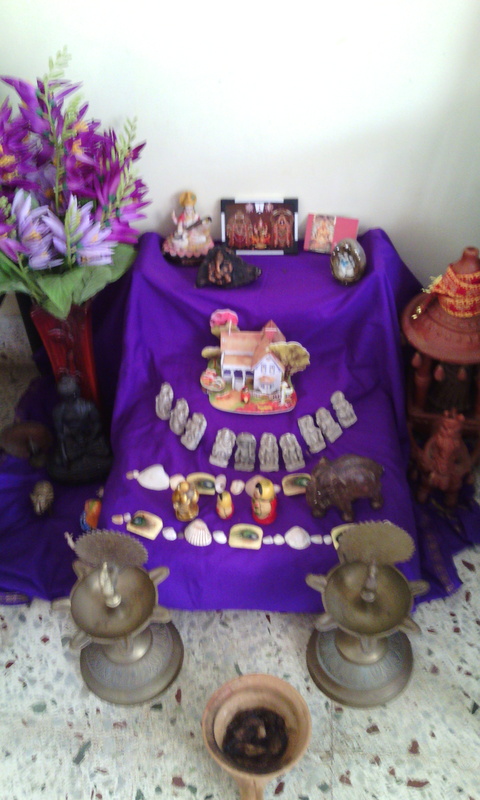 My daughter incidentally enjoyed it and she helped me put up the display. As kids I remember going to my friend’s house for Bommbe Habba and then discussing who had the best doll display etc. etc. But over the past few years since I was bed-bound the enthusiasm totally vanished. This year my daughter decided to do it on her own and she said she was going to break traditions and display the dolls the way she wanted it. I had to let her because my display dolls are missing. 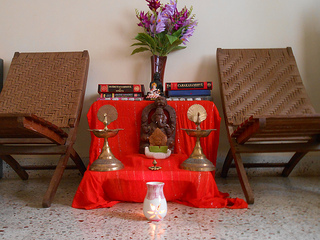 The Bommbe Habba traditionally begins on the first day of Navaratri, after kalasa Avahanam, or the ritualistic welcome of the three manifestations of the divine mother, Saraswati, Parwati and Lakshmi. Then wooden planks of odd numbers that 3-5-7-9-11 are kept. This is the mettalu or stairs. On which a sari is draped. Over this the deity is placed on the highest plank, and thematic arrangements are made on different planks. Stories from the Puranas, or royal processions, village or temple layouts and other everyday scenes are done. Miniature living rooms, kitchens were all part of it. Most of the toys and dolls displayed are from traditional toy makers. Like Kondapalli or Chennapatana. Traditionally Pattada Gombe or a Bridal couple doll made of teak wood gets the centre stage. These are traditional given to the bride during the wedding sometimes the display figurines are handed from generation to generation. I remember my grandmother Parwati telling me, a story with the miniature tallboy that she gave me to place on my Bommbe-mettalu. These dolls were symbolic of prosperity and fertility. Socially the festival coming when the rains decline, heralded the relaunch of the social interactions. Women invited each other home, there would be singing and some small games, then there would giving of the thambula or the take away gift. This year my challenge was having to go around collecting the various stuff, for the gift. But http://wedtree.com came to my rescue, I picked all that I wanted paid online and it was delivered nice and safe at door steps 48hrs later. God bless them. The Bommbe Habba, became relevant in an agrarian society as it encourage de-silting of irrigational canals and river beds, as the Bommbe Habba raised the demand for clay. 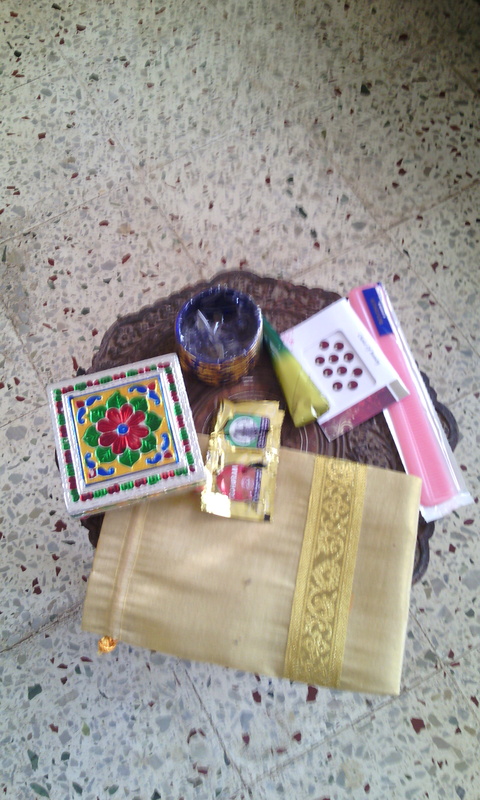 The guests are offered sundal, and some sweets. When I was a kid the sweet used to be shira, and eventually it turned to gulab jamoon. This time my mother suggested Carrot Kheer since I could make it before I left for clinic and it would be cool by the time my guests arrived. And unlike custard it would not be heavy. Disposable paper cups for kheer. Two large garbage bags. To collect the disposable stuff. Finally setting the thambulam bags and remembering to give it. Previous PostPrevious Helping our kids learn pedestrian skills.